Are you getting curious about concrete stenciling? Do you have a concrete driveway but would like for it to have a better finish? If your answer is yes to both questions, then stenciled concrete is the right choice for you. Stenciled concrete makes use of stencil patterns made from water resistant and hard to tear paper. There are many stencils available most especially in Wizcrete. There are a total of 28 stencil patterns available at Wizcrete. Ashlar Slate, Cobble Fan, Cobble Stone and Random Blue Stone are just a few of the in demand and more popular stencil patterns that clients are so fond of choosing. Stencil patterns at Wizcrete are not only viewable online but you can also use Wizcrete’s Visualizer which combines both stencil pattern and concrete color. Using Wizcrete’s Visualizer will give you a better idea of how your chosen pattern and color will match each other and how well it will compliment your house. Wizcrete offers clients 21 colors to choose from not only for stenciled concrete but also for stamped concrete and concrete resurfacing. Stenciled concrete is a popular choice for most homeowners because it mimics the look and even the feel of bricks, tiles and stones even though it is actually made of concrete. Stenciled concrete is very much realistic as it makes use of concrete that is overlaid and in so doing, leaves mortar joints. Mortar joints are originally the space between bricks, stones and concrete blocks and are very familiar terms in the field of masonry. However, through the use of stencil patterns as well as the overlaid concrete, having mortar joints is quite possible without using bricks, stones and concrete blocks at all! There are many advantages to stenciled concrete. Firstly, stenciling is a relatively fast process, most especially if you employ highly qualified concreters like Wizcrete to do the job for you. Craftsmen and labor men can work on large areas at one time since there is no need to wait for the concrete to set – keeping in mind that stenciling is basically overlaying another concrete to a previous one. Another advantage is that stenciled concrete is more flat compared to stamped concrete in terms of surface. Although there are mortar joints, these joints aren’t as deep as stamped concrete and can make cleaning way easier. It can also make snow shoveling more convenient compared to stamped concrete. Want your driveways and gardens to look fresh and beautiful? Your answer to this lies in the Wizcrete’s Decorative Concrete Stencils that can turn boring into fun, dull into attractive and ugly into something unique and simply beautiful! Concrete stencils are acquiring vast popularity among many customers as they not only get many options when it comes to style and design but that too in much less than they actually spend. One can never go wrong in choosing stencils while renovating their gardens or driveways. Wizcrete allows you to customize the look by creating eye catching special designs, company logos or monograms by letting the customers to choose from a wide selection of contemporary colours and patterns that are available, thus, giving them a chance to renew their existing concrete. At Wizcrete we also give you a chance to change the colour of the stones by many methods thus, giving you the perfect opportunity to splash some colour in your otherwise dull concrete surfaces. Not only is this but also a wide range of designs for concrete patterns which will leave you to unique decorative concrete options to further beautify your perfect havens. This unique home decorative concrete stenciling will make you want more and you can also decorate other surfaces like pools, patios, decks and entrance ways around your house. What’s more amazing is that Stencilled Concrete Driveways is backed with Wizcrete’s Triple Guarantee! Now all the more reason for you to choose Wizcrete as we provide you with these three great guarantees based on our valued customer’s happiness, satisfaction n safety. Firstly, a guarantee to complete your desired colour and design choices in the agreed time or Wizcrete will re-surface unless you are happy with the end result. Secondly, Wizcrete will pay for another re-surfacer of your choice in case you are not satisfied with the job done. Thirdly, we provide you with a 5-year works warranty that allows you to get free services in case your concrete re-surfacing shows signs of wear and tear. So what are you waiting for, choose from basic to more complex geometric patterns to suit your style. 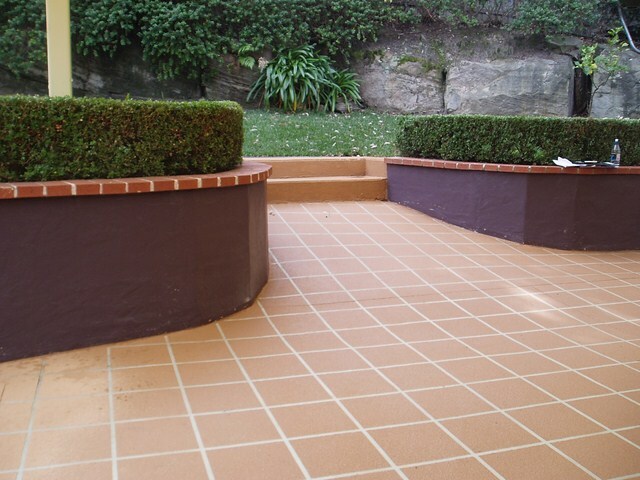 If you are a Sydney resident and would want us to rejuvenate your boring surfaces with these amazing techniques, then give us a call or you can also visit our website www.wizcrete.com.au. Feel free to call us at (02) 9499-4745 and we will be happy to provide you with a free quote. For a dramatic driveway make-over, there is no better way to make a drastic change of look than to choose an intricate design pattern for your driveway, that will make an statement like you wouldn’t believe. WizCrete offers you a wide range of patterns to choose from so that your driveway can have character and style, but let’s talk about a few patterns in specific that will capture your attention and will leave your neighbours green with envy! 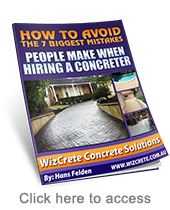 This is one of our most popular patterns at Wizcrete. It looks elegant, simple and classic and you simply can’t go wrong with a timeless brick pattern. This pattern is suitable for houses with a matching brick facade or a very rustic look. The pattern looks very similar to actual bricks and can only be told apart by its texture once it’s touched. The stone pattern works best for elegant houses with a very natural feel. We have many different colours of stone available for your driveway, so that your driveway can resemble stencilled stones as closely as possible to the real deal. 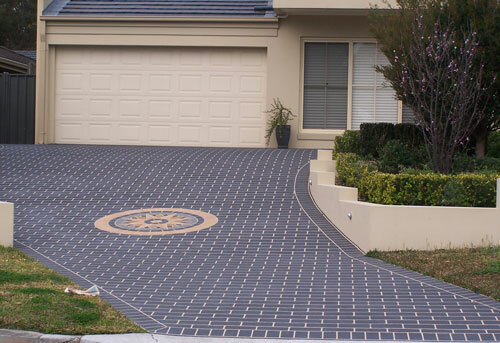 If you have more of a simple style, a sleek driveway with no pattern could be ideal for you. Just a clean driveway of a single colour could really add some character to your home’s facade without having to spend a lot of money and have to worry about a pattern. A driveway without a pattern is not necessarily boring. A simple driveway could compliment the facade of your house in a very modern and simple way. When choosing a pattern for your driveway, you must put into consideration the current image of your home and the image you want to have of your home. These elements are very important and the correct stencil pattern for your driveway could add significant curve appeal and value to your home. Choosing a pattern can be overwhelming with the wide range of stencil patterns we have to offer, but our friendly experts at WizCrete can help you choose the right pattern for your driveway and if you are a bit nervous about the end result, you can consult our gallery for before and after pictures of previous driveways our experts have worked on. Call us or visit us today, our experts are waiting for you! Concrete stenciling has made possible the creation of over-the-top designs that will surely melt your eyes away. Concrete stenciling is actually a process used to create a pattern in freshly poured concrete. When this process is done well, the result can be very artistically pleasing, creating the illusion of a cobblestoned, tiled, or similarly patterned surface. Stenciling uses a blocking technique and can actually be used on new or existing concrete. In order to create various decorative effects, a high quality paper stencil can be used. Appropriate applications for stencils include sandblasting, cast-in-place, overlayment, and vertical applications. Concrete stenciling can be done by homeowners themselves. However, lack of expertise can ruin the project. For stunning concrete stenciling projects, homeowners can contact Wizcrete. We have a variety of concrete stencil patterns that will suit your project’s needs. Concrete stenciling offers various advantages. Aside from being cost-effective, concrete stenciling provides a low maintenance cement surface. The finish is stronger than plain cement, provides a non-slip surface, and is more resistant to abrasion and impact. Exciting concrete stenciling designs can make a surface stand out while stopping weed growth. 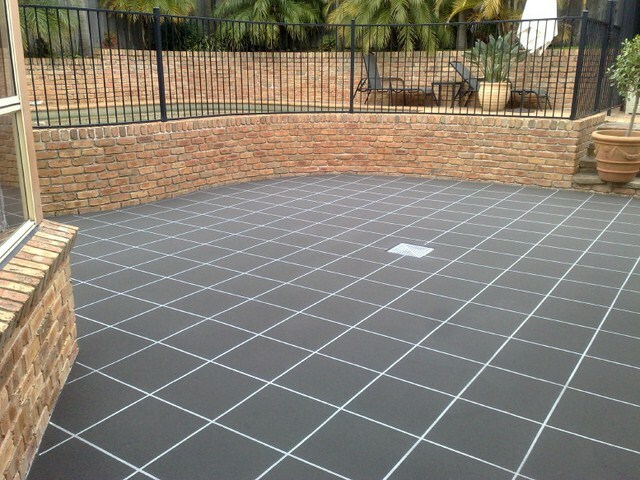 Wizcrete also offers customized concrete patterns. Even though customized patterns cost more, clients are given the liberty to choose the best designs that will suit their project. Since customized stenciled concrete is not reusable, it is best to order enough material to finish a certain project. The prices of customized stenciled concrete depend on how elaborate the design is, the size of the area, and the materials used for the final stencil concrete. Application and removal of stencils requires appropriate timing. Late removal of stencils will result in difficulty of removing it. On the other hand, early removal will ruin the pattern and can result in breakage of stones. Wizcrete is wary of all the precautions needed to create stunning stenciled concrete patterns. This makes sure that clients are given with a clean pattern that will make the area more beautiful. Concrete is a widely held material for flooring because it is highly resilient, and it can be installed over heating and cooling systems easily. Concrete is also comparatively inexpensive. Many people are not interested in concrete flooring since they have an image of the dull gray color of orthodox concrete. However, concrete stenciling can significantly enliven a floor, and guests may be surprised to learn that the flamboyant, textured flooring is essentially the result of concrete stenciling.